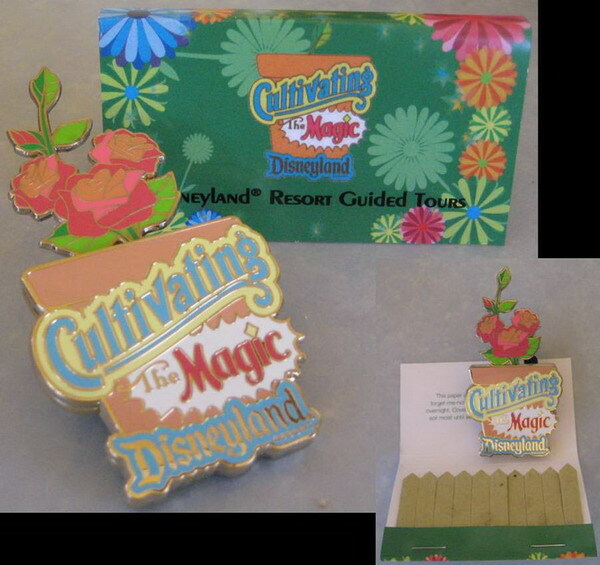 On Saturday, June 2nd, my daughter Kelly and I were part of an inaugural tour at the Disneyland Park called Cultivating the Magic, where cast members share their knowledge about the flowers, shrubs, trees, grasses, and other plant life at the Disneyland Park. Guests are asked to check in 15 minutes before the tour, and when we arrived the rest of the group was waiting for the tour to begin. I was pleasantly surprised to see that fellow DISers and friends, Chris Vettel, Jill Foster, and Melody Brinkman were also taking the tour. The tour limit is ten people, so with these three, Kelly and me, plus another lady, Jennifer, who said she lurks on the DISboards, we made up the majority of guests who were on the tour. There were three others, and a cast member monitoring the tour, plus our guide, Jon, which made for a total of 11 people. This is important, as you will see later. Currently, the tour is held in the morning, at 9am on Saturdays and Sundays, and at 10am on Mondays. I am glad that the tour starts early in the morning when the park is still fresh. 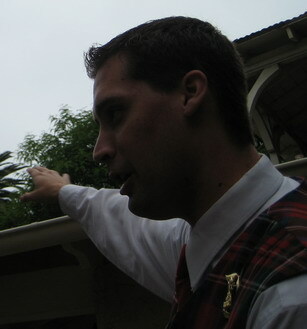 Jon began our tour with a little history about the people responsible for the plants at Disneyland, Bill (Morgan) Evans and his brother Jack. They had landscaped Walt Disney’s home, including the area surrounding his personal railroad, the Carolwood Pacific in 1952. Walt Disney was so impressed by their work that in 1954 he asked them to come up with the landscaping for Disneyland. So, in one year they had to design and incorporate that design into the park, and what a wonderful job they did. 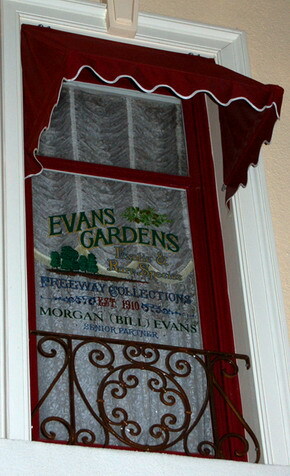 Bill Evans is a Disney Legend (inducted in 1992), and his picture can be seen on Main Street, where his specialty is Freeway Acquisition. You will have to take the tour to find out just why he was given that title. 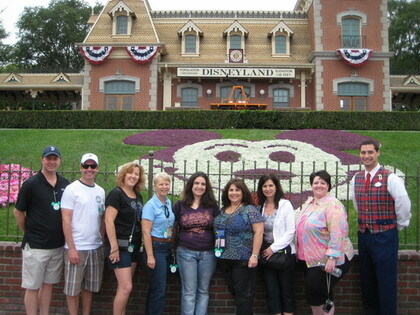 After this introduction to the genius behind the landscaping at the park, Jon led our group to the iconic Mickey floral at the front of the park, where we took a group picture. Jon then told us about the flowers that make up the Mickey portrait, including the fun fact that 10,000 flowers are used to make Mickey’s face and the floral decoration around it, and that this is changed nine times throughout the year. For just the Mickey portrait, we’re talking about 90,000 flowers per year! Jon then led us to Main Street, where we learned about the placement of flowers close to the ground and at eye level. The level of detail is amazing, and as we listened to our guide we also were able to appreciate the flowers in a new way. We made our way down Main Street to the Main Plaza, or hub as many of us call it, and there we were shown how the colors of the flowers are carefully picked to frame Sleeping Beauty’s castle in her colors. We then went to Adventureland, where we learned more about Bill Evan’s touch in creating the jungle in less than a year. He had to use existing plants, along with new plants, to create this untamed look. Our group boarded the Jungle Cruise to get a closer look at the plants. Jon commandeered the boat, and not only did we not have to wait in line, we had the boat to ourselves! He pointed out some of the plants, and let’s just say that there are orange trees planted in a very unusual way along those jungle rivers. After the Jungle Cruise, we were then led around Adventureland and we learned more about the plants there. 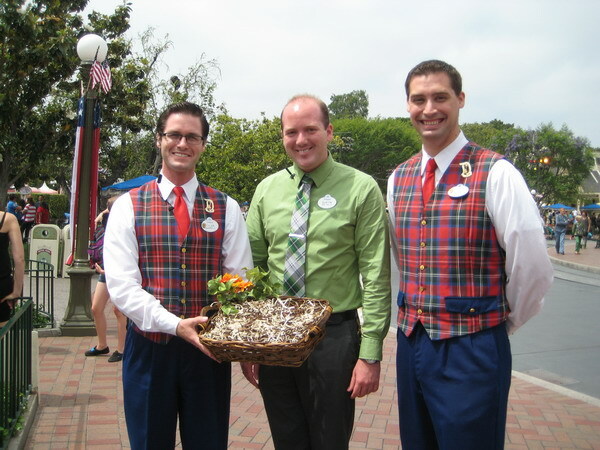 I really enjoyed learning about the special plants at Disneyland. Not only did they pay attention to plants that would enhance the look of the park, they also put in plants that have meaning, like the one tree that greets you as you enter Adventureland. There is a special story to it, and now every time I see it I will appreciate it for its history. 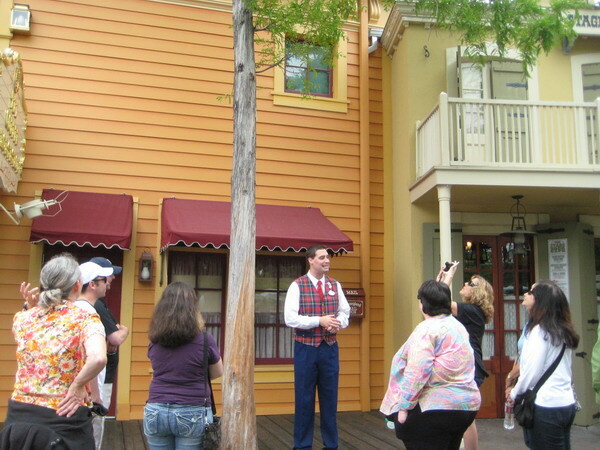 Here Jon points out a certain tree that has been on the property before Disneyland grew around it. We then headed to New Orleans Square to see the plants that really set the mood for the haunting attraction that stands there. Leaves are dark, flowers are blood red. The plants are significant, and vital in setting the tone for this attraction. We then went on the second attraction of the day. Like the Jungle Cruise we did not have to wait in line, but were able to walk right on. Although it was fun to go on the Haunted Mansion, we were left wondering why we went on this indoor attraction when we really would have preferred learning more about the foliage along the queue. Though we didn’t go into Critter Country, we did learn some about it on the tour before heading over to Frontierland. Frontierland uses plants to represent the southwest, and use a lot of native southern Californian plants, like bougainvillea, cactus, some feather bushes, cattails, and many other plants that give this land its distinctive air. Once again we learned about certain trees that have a special significance, including this one here that Jon is telling us about. 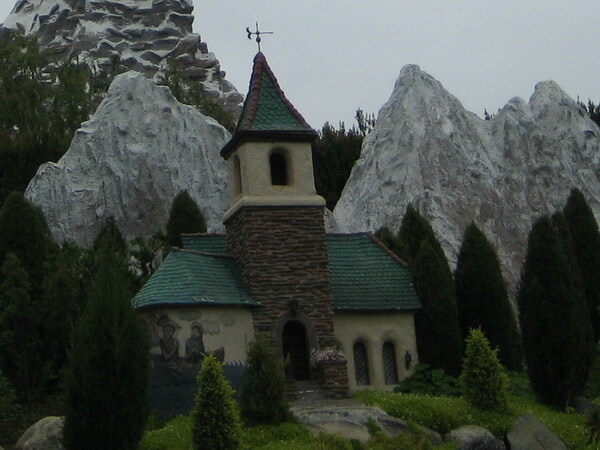 Our next stop was Fantasyland, which is more manicured to represent the landscaping for a lot of countries where the fairytales come from – Germany, France and England. 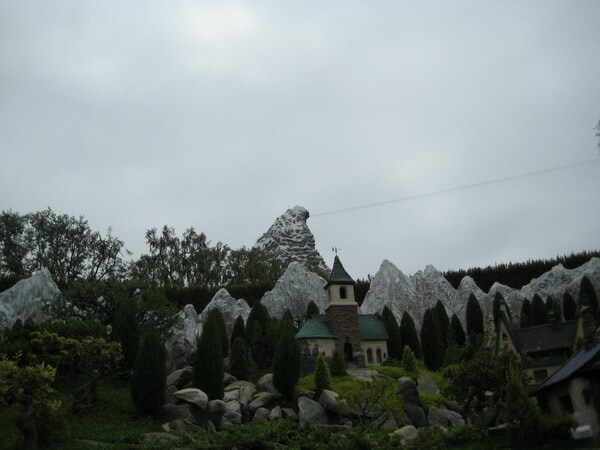 But at the attractions the landscaping matches the tone of the story, like at Snow White. Near the Dumbo attraction we were shown the Disneyland Rose. 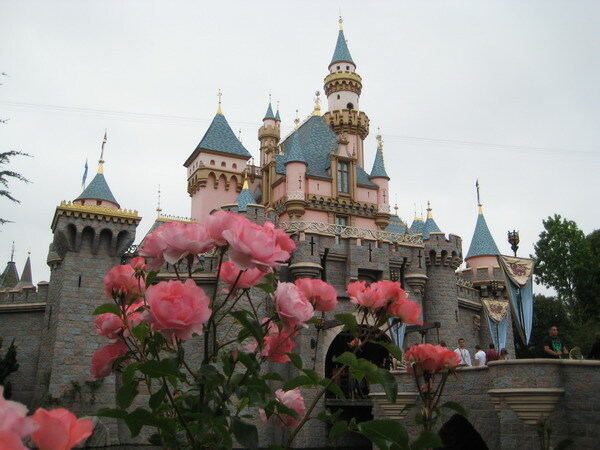 Disneyland wanted a special rose for the 50th anniversary, and began looking for one in 2001. Disney went to Jackson and Perkins, and found a rose in the floribunda family. You can see this rose in various areas at the park. I’ve seen it at the entrance to the park, by the Rivers of America, and now by Dumbo. 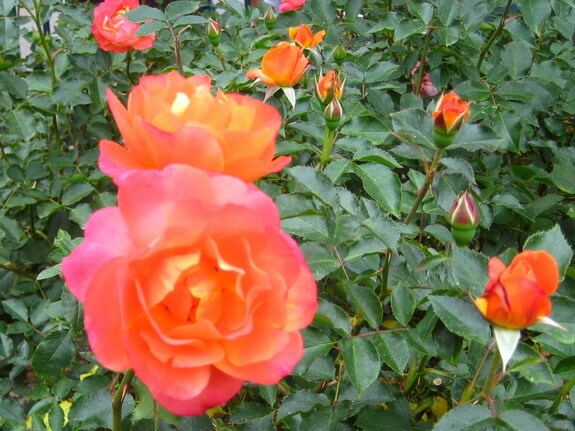 Right now the rose is in full bloom and fills the air with its sweet fragrance. Our tour then went to the Storybook Land Canal Boats. 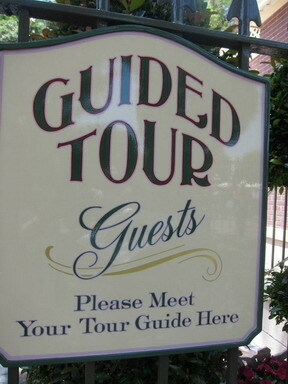 We were looking forward to this particular attraction because, darn it, we wanted to learn the secret behind growing the wonderful trees and shrubs there. Our group just fit in the little boat, which explained why the group limit was ten. Again, Jon commandeered the boat, and narrated the ride with a different perspective, with the focus on the various miniature plants. He did tell us the secret to growing the plants so tiny, and … well, you’ll just have to go on the tour to find out just how Tink uses that pixie dust. The details to these miniature buildings and real trees is just amazing, and you cannot catch all the details in just one trip. Our next stop was it’s a small world, where we learned just how Disney creates the beautiful topiaries that grace the grounds of the attraction. 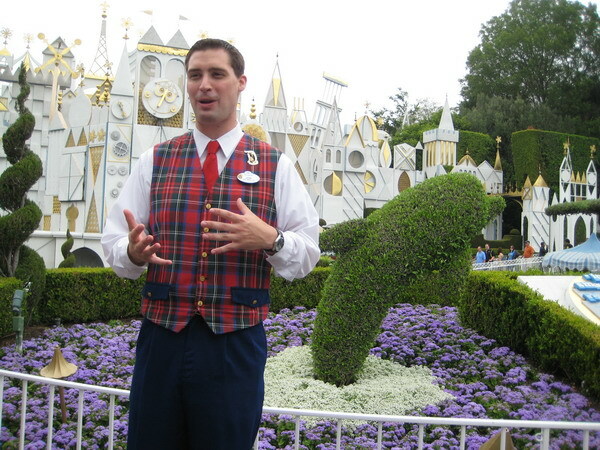 We learned that normally, topiaries take many, many years to grow, but with Disney magic, and some ingenuity, topiaries are grown much faster. 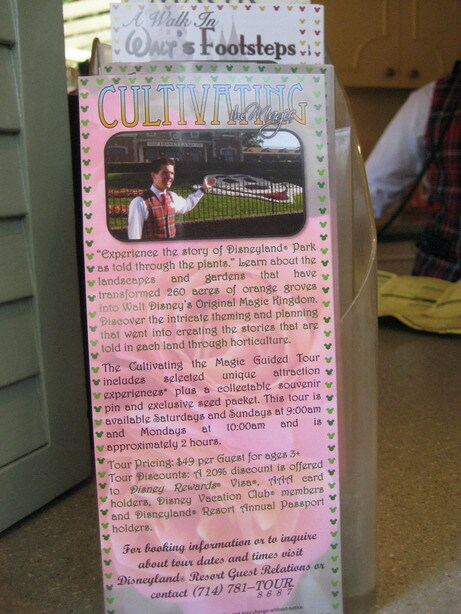 As we made our way to the entrance to Tomrrowland, Jon fed us more trivia about the various plants at the park. We stopped at the entrance to Tomorrowland, where we were told about the edible plants that are grown there. They are aesthetically pleasing, as well as being a good resource for food at the park. By this time it was 11:00, and time for the tour to end. A cast member had come with a flower box full of treats for us, and we all received a neat commemorative pin that has a stem poking out. When you pull on the stem you see three Disneyland roses in the shape of Mickey’s head. In addition, we were all given “matchbooks” where the matches were really made of seeds of forget me not flowers, so we “wouldn’t forget the tour” that we went on. It was such a nice touch to receive the pins and flower seeds, and a nice way to end the tour. I was surprised that the tour was actually over. It lasted two hours, and the time just flew by. We learned about some of the plants at the parks, interesting facts about the landscaping, and saw special trees that have a real significance, not only to Disney, but historically as well. Another couple of things we learned is that there is a book at City Hall that names all of the plants at the Disneyland Resort. At the time of the tour, the book was not in City Hall because it was being updated since the landscapers had just changed out some of the plants. In my opinion, the landscaping department has to be one of the best run departments at Disneyland. They have excellent attention to detail and sense of timing to change the look of the park several times a year seemingly overnight. Anyone who has any question regarding the landscape at the Disneyland Resort can email questions to dlr.horticulture.questions@disney.com, and someone will respond with an answer. After the tour, Kelly, Chris, Jill, Melody and I chatted about our experience. We all agreed that for an inaugural tour they did a good job, and that Jon was an excellent tour guide. We enjoyed going to the different lands and learning new things about the Magic Kingdom. We really thought the pin and seeds were a great gift for taking the tour. We also discussed things that we think could be improved upon. We would have liked to have been given a paper at the beginning of the tour that we could refer to when Jon pointed out different plants. Sometimes we missed the names of the trees, or some of the details, and we would have liked to have something to refer to. We were all a little perplexed when we went on the Haunted Mansion. In retrospect we would have preferred using that time to explore Tomorrowland more in depth. There are so many plants there and we wanted to learn about them. Despite the minor improvements we discussed, we all enjoyed taking the tour. I would recommend taking this tour, however, I do not recommend taking children, unless they are very interested in the plant life at the park. Several of us look forward to taking the tour again during the holiday season when the landscaping will drastically change. The tour is offered on Friday and Saturday mornings at 9 a.m. and on Monday mornings at 10 a.m. The regular price is $49 with a 20% discount for any of the following: DVC, AP, AAA, or Disney Rewards Visa Card. You can book the tour by calling 714-781-8687.